I am not even joking when I say this, but once this dip hits your lips you will be saying what everyone says, "I want the recipe!" You are about to get the recipe for the most requested and TASTY dip ever invented! Unfortunatley, I am unable to take credit for this magical creation. But I do make it practically every weekend. And, I am going to confess that when I make it for whatever the occasion, I stash a little away for me the next day because it's just that yummy! And I have an eating problem! I can't stop! Here is a picture of the delicious Pottery Barn Dip below. This recipe came from my sister Adie's husband Meade's family. The Smiths. They are BRILLIANT chefs and make the most wonderful, mouth watering food. Every recipe of theirs is absolutely delish! This particular recipe is from my sister Adie's sister in law. So thank you Megan for passing this recipe along to our family. I know I need all the help I can get. I like to combine everything except the cream cheese. After making it 460 times I feel this works the best. 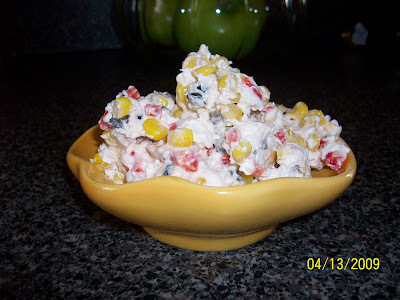 So stir Corn, Black Olives, Red Pepper, Jalapenos and Ranch Mix together until mixed well. After letting the cream cheese soften for about 10 minutes, add the two packages to your mixture and combine really well! It should be evenly combined and smooth. Serve cold with crackers or chips. Our family's favorite choice is Scoops! Please let me know if you make this and let me know what you think. I am so excited to spread the happiness to all of you. Now when people ask me for the recipe I will just point them to my blog to get it. Much easier on me. That does sound like the best recipe EVER! Thanks! Next time I have to bring an appetizer or dip somewhere, I'm making this. When you say "large" ranch dressing mix, does that mean two of the packages (like they're sometimes sold)? I've never seen a large vs. small size...only the standard size package. 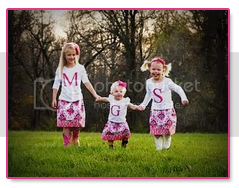 Also, did you make the girls' hairbows for their Easter ensembles? You need to put those on Etsy! Hey Megan! I usually buy a 4 pack of Hidden Valley Ranch dressing mix. They are big size packets... not those little ones that I have seen so that is why I say large. Hopefully this helps a little. Sorry about that. Yes I made their Easter bows! They turned out cute... bright but cute! Thanks! hi Marta! I made your Pottery Barn dip on Sat for a little KY Derby party we had....loved it! Everyone else loved it, too!! Thanks for sharing!! I LOVE your blog!!! sounds delish, I'm making it for New Year's eve party! thanks!! What a small world! I work at Ellisville Elementary in Elliville, MO where Adie Smith works! She made this recipe for a baby shower for our coworker and I googled it to get the recipe, only to find her sister's blog! :) too funny. Thanks for the recipe - I love your blog!